If you're looking for an exterior paint that lasts, you can't go wrong with Behr Premium Plus Ultra. Those on a budget can get similar results from Behr Premium Plus. Behr Deck Plus Solid Color Waterproofing Wood Stain leads the pack among solid wood stains in professional tests. Behr also shines in the semi-solid deck stain category. 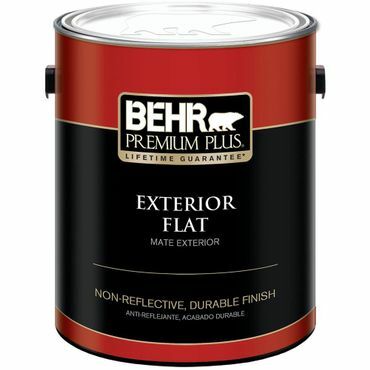 Behr Premium Plus Ultra is a solid choice if you're looking for a great value. It provides very good coverage overall, impressive durability and is easy to use. With just 50 grams per liter of volatile organic compounds (VOCs), it's one of the lowest-VOC paints available, aside from zero-VOC paints. While it's not the lowest-priced exterior paint, Behr Premium Plus Ultra shines in testing, scoring well for its resistance to cracking, mildew, color changing and dirt. 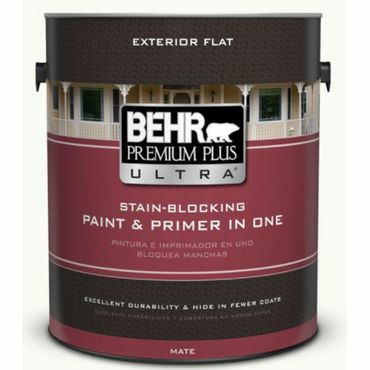 Although it doesn't offer the same resistance to dirt as its pricier counterpart, our Best Reviewed Behr Premium Plus Ultra, Behr Premium Plus is a good choice if you're looking for a lower-priced exterior paint that still offers good resistance to cracking, color change and mildew. Reviewers say it offers great coverage in just one or two coats and is easy to apply, spreading evenly over surfaces and drying quickly. 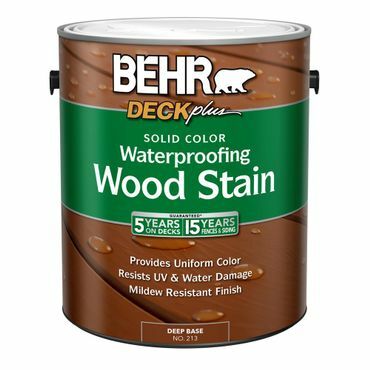 Behr Deck Plus Solid Color Waterproofing Wood Stain holds up to the equivalent of three years of outdoor exposure in professional tests, maintaining an impressive appearance and resisting color change, cracking, dirt and mildew. A few users complain of peeling after a year or two, but these issues don't occur in tests, and experts suggest proper surface prep and application are key. Some users say it lasts for up to 10 years. 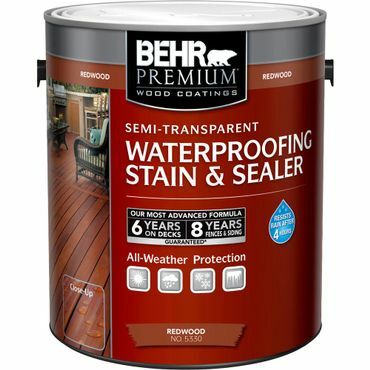 Behr Premium Waterproofing Wood Stain & Sealer comes in several options, including solid color, semi-transparent and transparent. All perform well, but the semi-transparent opacity outperforms similar stains in expert testing. You should very much ignore the claim that this stain will look good on decks for 6 years (10 years for the solid opacity), but it should still look good for two -- which is much better than average among semi-transparent stains. Exterior paint is used for a variety of outdoor applications, from siding to fences, garage doors, sheds and other outdoor structures. Because outdoor applications mean exposure to sunlight, temperature fluctuations, and weather elements, durability is key when selecting an exterior paint. A quality exterior paint will retain its original color for several years and resists cracking, dirt, fading and mildew. Top paints will generally get the job done in fewer coats than cheaper paints, though experts recommend applying at least two coats, as it leads to a longer-lasting finish. That said, some cheaper house paints still deliver a quality finish. Experts and many users recommend buying the best paint you can afford, but we found that some of the best exterior paints land in the middle of the price spectrum – around $30 to $40 per gallon. Some of those mid-priced exterior paints rival and even out-perform more expensive paints costing $70 or more per gallon. Exterior wood stain is the best choice for decks, rough-finished wood (such as cedar shake and log cabins) and any exterior project where you want the grain of the wood to show. Unlike paint, which forms a thick, smooth film over the surface of the wood, experts say the best stains actually soak into the wood. While paint can peel and chip over time, a good stain should simply fade as it ages. A wood stain won't last as long as a properly applied coat of exterior paint, though experts and professionals add that its longevity depends on the type and quality of stain you choose, how it well it's applied and how harsh your climate is. Another factor is whether the stain is applied to a horizontal surface (such as a deck floor), which suffers more weather abuse than a vertical surface (such as a wall). Most paints contain volatile organic compounds (VOCs), the harmful chemicals in paint fumes that have been linked to health and environmental problems such as poor air quality. All exterior paints and wood stains must meet VOC limits set by the federal government, but some environmentally-minded consumers prefer low-VOC paint – which has even lower VOC levels than what is mandated by the government. Keep in mind these numbers are what's claimed by the manufacturer, and adding tints and colorants to some brands of paint will add VOCs. Performance of low-VOC and zero VOC exterior paint is on par with their higher-VOC counterparts, but they do tend to cost more per gallon. Once you decide which exterior paint is best for you, you'll need to decide on a type of finish. This is important because choosing the wrong type of sheen can be just as bothersome as choosing the wrong color of paint. The rule is the glossier the sheen, the more detail it shows. So if you're painting over a surface with a lot of imperfections, such as siding, a flat finish is best for the job as it has the dullest sheen. Eggshell and satin have a slightly glossier shine but also can be used for siding. Semi-gloss and high-gloss finishes are often used for painting trim, as they accent the surface details and are easy to clean. "J.D. Power 2017 Paint Satisfaction Study"
We found the best review of exterior paints at Consumer Reports, where editors test dozens of paints and wood stains, rating a paint brand only after it has completed the equivalent of nine years' real-world exposure in simulated test environments. Ratings are based on durability, including resistance to dirt, mildew, fading and cracking, as well as considerations such as VOC levels. We also consulted the J.D. Power and Associates 2017 Paint Satisfaction Study, which gauges consumer satisfaction on overall paint brands rather than individual formulations, as well as thorough reviews from professional painters at Jack Pauhl and This Old House. Finally, we consulted consumer reviews at retail sites such as Lowe's and Home Depot, where buyers report on issues such as paintbrush and roll marks, fading, lack of coverage, and other issues, or praise paint that performed particularly well for their projects. We also found a few forums for professional painters and do-it-yourselfers, where professionals and consumers alike weigh in with recommended exterior paints and stains and report on performance.